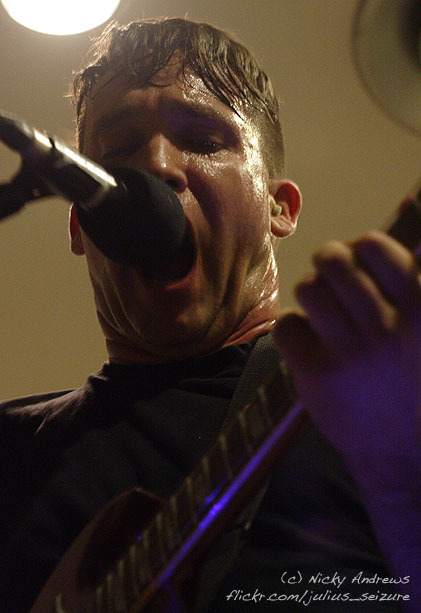 Xiu Xiu is one of those bands that polarize listeners – you either love them or you hate them. I was thrilled to hear they were playing in the Pacific Northwest, while my husband chose to sit it out in the car. 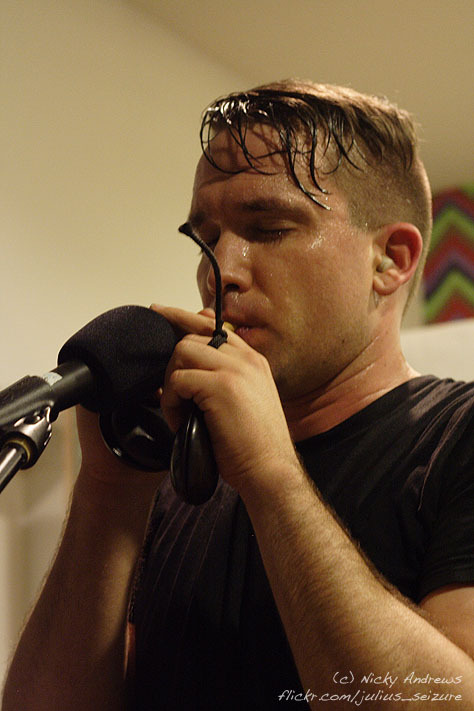 They are a band whose antics I find fascinating – whether in the form of “Xiu Xiu for Life” t-shirts painted with the band members’ own blood, or their latest video “Dear God, I Hate Myself”, a controversial effort which features keyboardist Angela Seo inducing vomiting while frontman Jamie Stewart happily vanquished a chocolate bar. 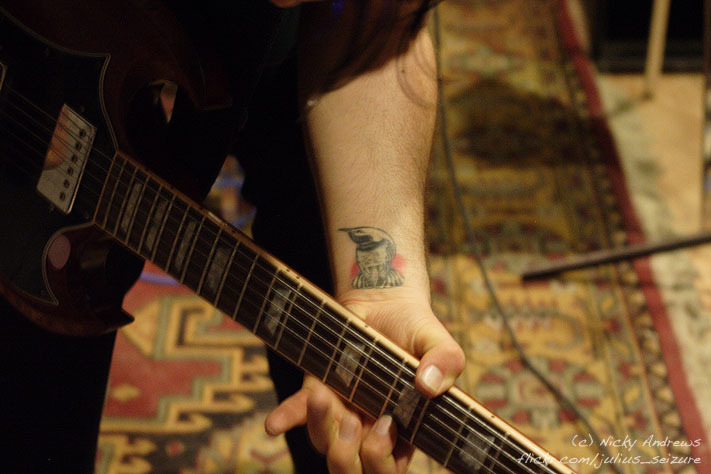 Similarly, Stewart’s dark yet ridiculous lyrics delight legions of fans – I’ve recently become fond of describing people as a “sopping wet towel of stupidity”. On Tuesday night Xiu Xiu put on a condensed show at The Northern – Olympia’s answer to volunteer-run venue The Vera Project. Percussionist Ches Smith was absent from the lineup, and although this was not explained I am inclined to speculate that perhaps it was simply that there was a shortage of room onstage – instruments and equipment for Jamie and Angela took up the entire 8 x 8 ft stage. Not content with the standard keyboard-and-guitar setup, the stage also boasted racks of gongs, cymbals and cowbells, as well as quirkier instruments ranging from a lemon-shaped maraca to a Nintendo DS fitted with a keyboard application, and not least of all an apparatus that resembled something ripped from a snorkel. Spanning about an hour long, the distortion-heavy setlist included old favourites such as “I Luv The Valley OH!”, as well as new tracks “Dear God, I Hate Myself”, “Chocolate Makes You Happy” and “Gray Death”. The all-ages crowd swayed, cheered, danced along and were happy just to come along for the ride. The pair felt no need to build a rapport with the audience, although Seo made short work of a heckler during the soundcheck, imitating his slack-jawed “whaat?” to perfection and much laughter. 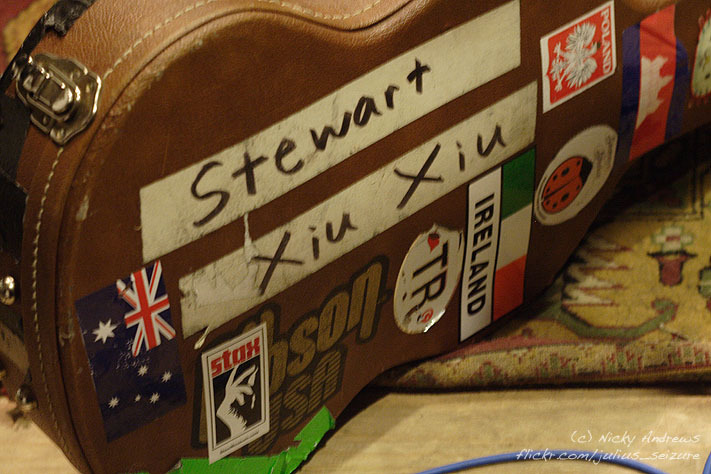 Stewart projected a steely exterior as he stormed through a multitude of guitar riffs and cymbal-clangs – rarely have I seen someone perform with such a singular focus. 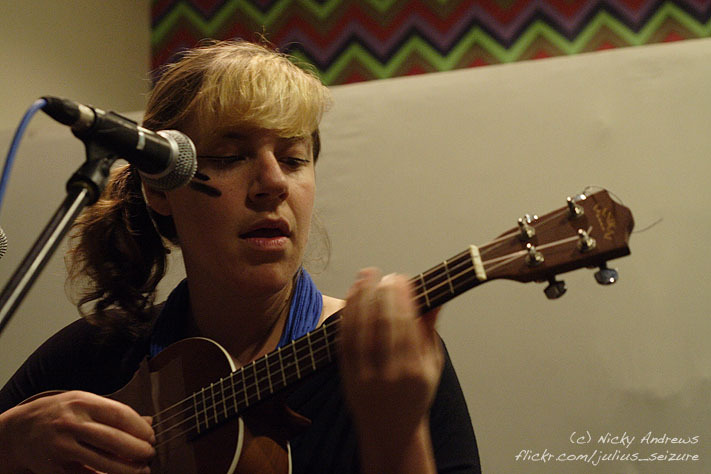 They say that any publicity is good publicity, and one artist who should bear that in mind is New England’s own tUnE-yArDs, aka Merrill Garbus. Her performance was spirited, soulful and innovative, making ample use of two drums, two microphones and looping pedals to create a lo-fi cacophony that earned accolades from the audience. At times though, her yodeling, screeching and bleeping vox fell short of the Bjork-like world she was attempting to create, resulting in laughter from the crowd and even her own bass-player! I found her vocal range spanned from ridiculous to utterly enchanting, and will definitely try to catch her again. Garbus has a wide range of influences, from Yoko Ono to Cyndi Lauper – and her drumming/chanting style can sometimes conjure up the mysticism of West Africa. Quirkiness aside, she has opened for Dirty Projectors and will be playing at Sasquatch this year, proving that sometimes it’s better to be different than to be lost in a sea of mediocrity. Xiu Xiu are fundraising for At the Crossroads, and donors are thanked with a number of small gifts ranging from photos with the band, to handmade postcards and an exclusive collection of photos by David Horvitz. Donations are accepted online or at show venues – see their website for more details. Written by: Nicky on 03/25/2010.